Scientific skeptics believe that empirical investigation of reality leads to the truth, and that the scientific method is best suited to this purpose. Considering the rigor of the scientific method, science itself may simply be thought of as an organized form of skepticism. There is considerable overlap between skeptics, atheists, scientists, nerds, geeks, humanists, secularists and other folk of this kind. 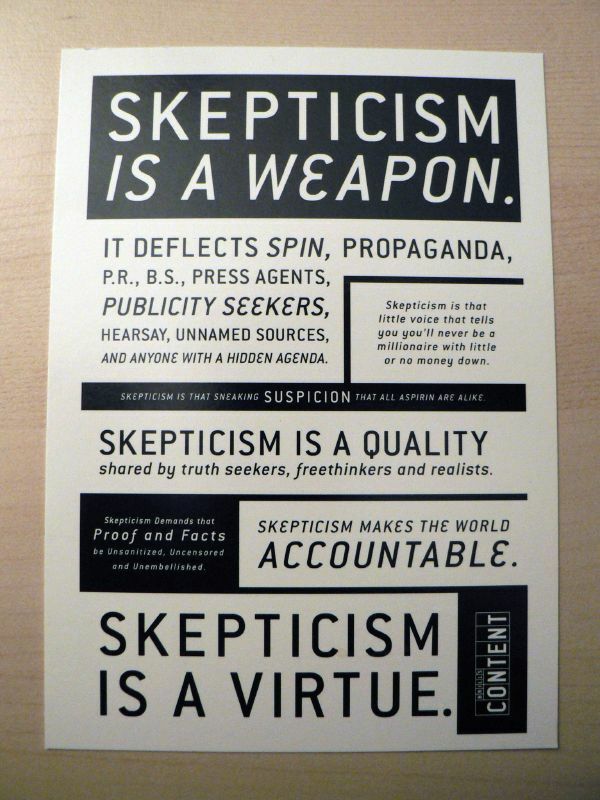 And I suspect that most people who would qualify as skeptics probably don’t use this label to describe themselves. You don’t have to – but it’s a convenient way to recognise like-minded people. Skeptics get terribly excited when they meet a fellow skeptic at some party. But I expect that model train enthusiasts get excited, too. People who choose to wear this label often do so because it has proven to be the best, most fitting description of their worldview, and it even defines their lifestyle to some extent. Just like people who identify as Christians, foodies, or humanists. But skepticism as a grassroots movement is also characterised by activism, forming groups, societies, going to events and the like. Earlier this year I became a member of the local organisation, Australian Skeptics Inc (ASI). We do outreach, publish a quarterly magazine, and are generally a really active bunch. And the reason I’m actually telling you all this is because the biggest ASI event of the year is looming. This weekend several hundred like-minded people from across Australia and overseas will gather at the 30th Australian Skeptics National Convention.2 It will be pretty amazing. Hence I’ve decided that all this week on this blog I will be celebrating not only science, but also scientific skepticism. Tomorrow – about my favourite skeptic. He was also a scientist.